he Economic Alternating Pressure System is suitable for apoplectic or patients who must lie on the bed for a long time and can be used in the hospital or at home. This system continually changes pressure points which is same as a gentle massage at first sign of a pressure sores. The Economic Alternating Pressure System is a cost effective therapeutic overlay for existing pads. The Economic Alternating Pressure Bubble Pad is designed according to the Medical standard which is with a heavy gauge, durable, stain resistant PVC. The unique design of this bubble pad allows more contact points offering a superior therapeutic effect. The system carries our high quality construction and can be easily set up and run. 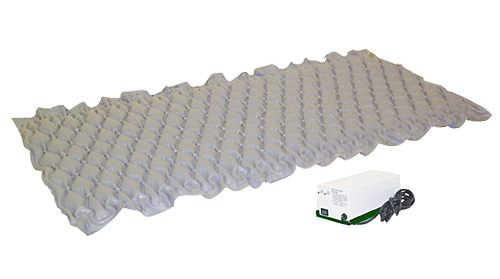 The PL-8530 Economic Multi-tubes Pressure Relieving System is an alternating overlay air mattress system that has been designed for use within the community, care and nursing home environment - for people at risk of pressure sore development.Its whisper quiet pump-30dB, AB alternation system, ease of use plus its incredible price point makes it one of the sectors most popular entry level mattresses. The PL-8530 Economic Multi-Pressure Relieving System is suitable for persons and includes manual pressure adjustment, visual power off alarm and CPR. The PL-8530 Economic Multi-Pressure Relieving System Utilizes subtle AB alternation and comes complete with a comfortable vortex cover that is both waterproof and breathable. The entire system has been built to the highest standards. It is easy to use and designed to offer several years of everyday use. Cells within the mattress alternate (inflate/deflate) over a set time period; this assists blood flow and relieves pressure from under the body. This type of alternation has been proven to assist in the healing process of pressure sores and also to prevent the onset of pressure sores. Straps located on base of mattress secure the overlay to the mattress, No need for mattress turning. The PL-8530 Economic Multi-Pressure Relieving System comes complete with a durable and easy to use pump that will cope with clients weighing up to 200 KGs / 25 Stones. The PL-8530 Economic Multi-Pressure Relieving System is suitable for early sign of pressure sore formation, Grade 1 & Grade 2. The incredible PL-8535 Multi-Pressure Relieving System is one of the most effective and versatile of the true alternating overlays available. It is simple to set up and fits most standard hospital and care beds. The PL-8535 Multi-Pressure Relieving System is designed to offer the patient comfort and care whilst its full 24 cell multi therapy system is designed to assist in the effective prevention of pressure ulcers. The PL-8535 Multi-Pressure Relieving System includes the ever popular A/B alternation system which is proven to stimulate capillary action and to assist with the healing of pressure sores. A/B alternation means that when the pressure increases on the first, third and fifth cells - it decreases on the second, fourth and sixth. At the end of each cycle, which takes approximately ten minutes, the reverse occurs which means that high and low pressures stimulate the capillaries to help ensure that tissue oxygenate on and nutrition occur alongside the removal of toxins. The PL-8535 Multi-Pressure Relieving System comes complete with a durable easy to use pump that will cope with clients weighing up to 200kgs, and offers a low pressure range of 30 – 60 mmHg. The mattress uses a tough bacteriostatic cover and includes easy to use CPR facility. The popular A/B alternation system is proven to stimulate capillary action and to assist with the healing of pressure sores. A/B alternation means that when the pressure increases on the first, third and fifth cells (A cells) - it decreases on the second, fourth and sixth (B cells). The PL-8535 Multi-Pressure Relieving System comes complete with a durable and easy to use pump that will cope with clients weighing up to 200 KGs / 25 Stones. The PL-8535 Economic Multi-Pressure Relieving System is suitable for early sign of pressure sore formation, Grade 1, Grade 2 & Grade 3. Pe & Le Medical is dedicated to providing the home heathcare field with the highest quality air therapy products available in the industry today. Pe & Le Medical is one of the worlds foremost pressure care companies that manufacture and distribute a variety of pressure care systems to care providers throughout the world.Pe & Le Medical used only the finest materials and the latest technology in the development, engineering, manufacturing and production of these products. Their mission is simply to provide the highest levels of comfort and pressure care at an internationally affordable price, which is being achieved through their excellent range of of Pe & Le Medical. of Pe & Le Medical are synonymous with reliability and service, which makes them as popular with hospitals and care homes in the more remote regions of the earth, as indeed they are in its busiest.